Schizolachnus obscurus apterae are brown (cf. Schizolachnus pineti which are dark greyish-green or occasionally brownish). They are covered in greyish white wax which can make it difficult to determine the underlying colour. The fourth rostral segment (RIV) is 1.6-2.1 times the length of the fifth rostral segment (RV) (cf. Schizolachnus pineti in which RIV is 2.3-3.7 times the length of RV). RV has an extended tip and is 43-60 µm long (cf. Schizolachnus pineti in which RV is short and stumpy and is 33-43 µm long). The hind tibiae are dark and less densely hairy than in Schizolachnus pineti. 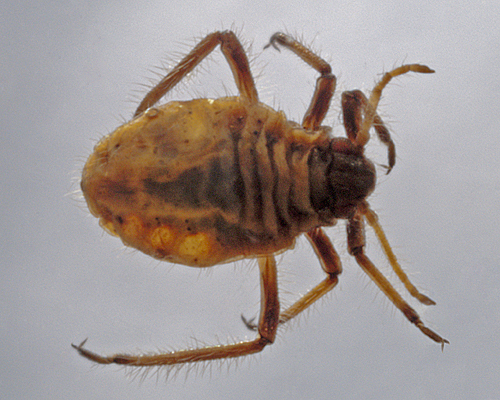 The body length of adult Schizolachnus obscurus apterae is 1.9-2.7 mm. The alate (see second picture above) is also brown and covered in dense grey wax meal. 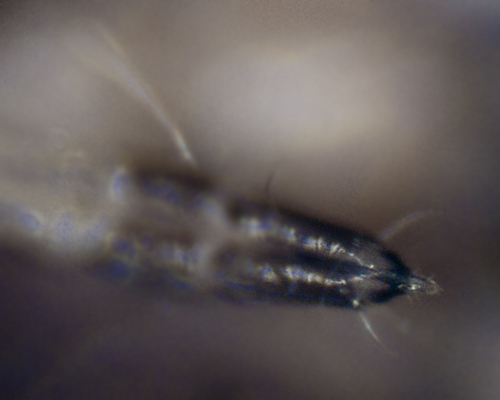 The micrographs below show an apterous adult Schizolachnus obscurus, dorsal, in alcohol - and tip of the rostrum. 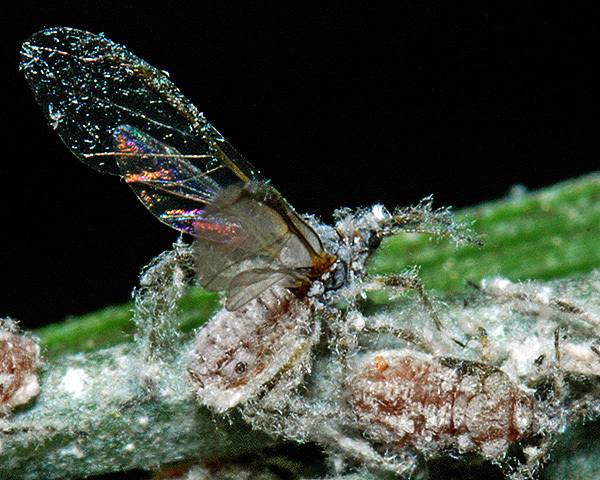 The waxy brown pine needle aphid is mainly found on the needles of European black pine (Pinus nigra), but has also been found on pine species such as mountain pine (Pinus mugo) and stone pine (Pinus pinea) within Europe. Sexual forms have been found late in the year (October to December), but in mild winters parthenogenetic overwintering may occur. Schizolachnus obscurus is found in Europe east to Turkey and Georgia, and has been introduced to North America. 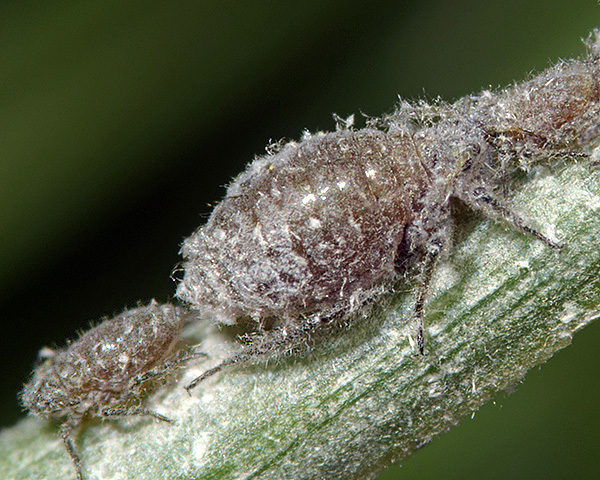 Blackman & Eastop list about 170 species of aphids as feeding on pines worldwide, and provides formal identification keys for aphids on Pinus. At least 18 of these species occur in Britain on Scots pine and/or Corsican pine, as well as on a variety of less commonly planted pines. Of the 21 species on Corsican pine (Pinus nigra) Baker (2015) lists 12 as occurring in Britain: Cinara acutirostris, Cinara brauni, Cinara pinea, Cinara pini, Cinara pinihabitans, Cinara schimitscheki, Eulachnus agilis, Eulachnus brevipilosus, Eulachnus rileyi, Pineus pini, Schizolachnus obscurus, and Schizolachnus pineti.